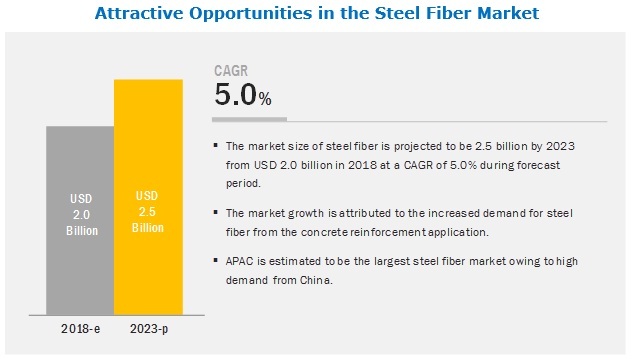 [103 Pages Report] The steel fiber market is projected to grow from USD 2.0 billion in 2018 to USD 2.5 billion by 2023, at a CAGR of 5.0% between 2018 and 2023. The market is growing due to the high demand from infrastructure and construction industries. Steel fiber is used in these industries as they exhibit properties such as superior tensile strength, crack resistance, durability, corrosion resistance, and high shear strength. Hooked steel fiber is expected to account for the largest share of the overall steel fiber market. Steel fiber comes in five types – hooked steel fiber, crimped steel fiber, straight steel fiber, deformed steel fiber, and others. The hooked steel fiber segment is expected to lead the overall steel fiber market during the forecast period. Hooked steel fiber is used in concrete reinforcement in hydraulic structures, airport and highway paving, industrial floor, refractory concrete, bridge decks, shotcrete linings, and explosion resistant structures. Hooked steel fiber substantially enhances initial crack strength and provides post-crack strength. Hooked steel fiber forms stronger joints, which results in low maintenance of the structure. Concrete reinforcement is projected to be the largest application of steel fiber during the forecast period. Steel fibers are being increasingly used in the construction industry as it is used in flooring, tunnel lining, precast, shotcrete, and so on. Steel fiber is used in concrete reinforcement, composite reinforcement, refractories, and others. They are majorly used in concrete reinforcement application. Steel fiber offers high tensile strength, durability, corrosion resistance, crack resistance, and high shear strength. Owing to these properties, they are used in the construction of flooring, tunnel lining, heavy duty pavements, precast, shotcrete, and others. APAC is expected to lead the steel fiber market during the forecast period. APAC is the biggest steel fiber market. The region is witnessing high growth of the steel fiber market. Majority of the steel fiber manufacturers across the region are constantly involved in improving the quality of the product. The manufacturers are adopting various growth strategies to strengthen their position in the market. The region has some of the prominent steel fiber manufacturers such as Yuthian Zithai Steel Fiber Manufacturing Co. Limited. The steel fiber market comprises major manufacturers such as Arcelor Mittal (Luxembourg), Bekaert (Belgium), Fibrometals (Romania), Nippon Seisen (Japan), Zhejiang Boean Metal Products (China), Green Steel Group (Italy), Spajic Doo (Serbia), Hunan Sunshine Steel Fiber (China), Yuthian Zhitai Steel Fiber Manufacturing (China), and R. STAT (Saint-Jean-Bonnefonds). The study includes an in-depth analysis of these key players in the steel fiber market, including profiling the companies and analyses of key market strategies. Arcelor Mittal is one of the leading players in the steel fiber market. The company provides high-grade steel fiber, which is extensively used in concrete reinforcement application. For maintaining its competitive edge in the market, the company majorly focuses on acquisition as its main strategy to maintain its leading position in the steel fiber market. With its presence in 18 countries across 4 continents, the company has a strong distribution network. It is also focused on expansions in the market to cater to the increasing demand for steel fiber. In August 2017, Arcelor Mittal (Europe) announced a three-year investment program for expansion worth USD 1 billion for Mexico. In August 2014, Bekaert (Belgium) established a steel plant for manufacture steel fiber under the brand, Dramix. This expansion helped the company to cater to the increasing demand from the infrastructure and construction industries in Latin America. In August 2014, Bekaert (Belgium) entered into a sale and distributing joint venture with Maccaferi. This development has helped the company to promote its steel fiber products in underground construction applications. What are the major applications of steel fiber? Which type of steel fiber is majorly consumed? Which region is the largest and fastest-growing market for steel fiber? What are the manufacturing processes used for manufacturing steel fiber? The study involved four major activities to estimate the current market size for steel fiber market. Exhaustive secondary research was done to collect information on the market, peer market, and parent market. The next step was to validate these findings, assumptions, and sizing with industry experts across the value chain through primary research. Both the top-down and bottom-up approaches were employed to estimate the complete market size. Thereafter, market breakdown and data triangulation procedures were used to estimate the size of market segments and subsegments. In the secondary research process, various secondary sources such as Hoovers, Bloomberg BusinessWeek, and Dun & Bradstreet were referred to identify and collect information for this study. These secondary sources included annual reports, press releases & investor presentations of companies; white papers; certified publications; articles by recognized authors; gold standard & silver standard websites; fiber reinforced concrete association; regulatory bodies; trade directories; and databases. 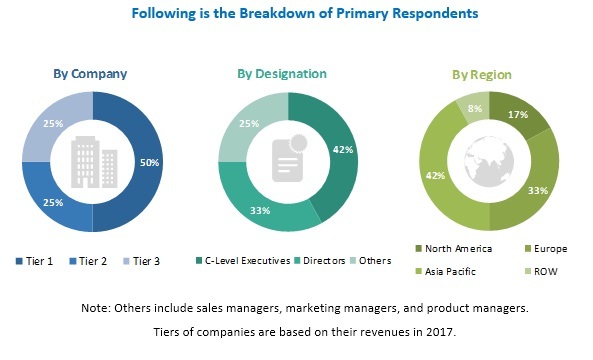 The steel fiber market comprises several stakeholders such as raw material suppliers, processors, end-product manufacturers, users, and regulatory organizations. The demand side of this market is characterized by the development of infrastructure, construction, and textile industries. The supply side is characterized by advancements in technology. Various primary sources from both the supply and demand sides of the market were interviewed to obtain qualitative and quantitative information. The industry’s supply chain and market size, in terms of value, are determined through primary and secondary research processes. All percentage shares, splits, and breakdowns are determined using secondary sources and verified through primary sources. After arriving at the overall market size using the market size estimation processes explained above, the market was split into several segments and subsegments. To complete the overall market engineering process and arrive at the exact statistics of each market segment and subsegment, the data triangulation and market breakdown procedures were employed, wherever applicable. The data was triangulated by studying various factors and trends from both the demand and supply sides of the market. This research report categorizes the steel fiber market based on type, application, manufacturing process, and region.